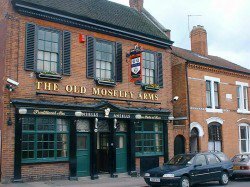 Welcome to the Old Moseley Arms. A beautiful back street pub, hid away in Balsall Heath, Birmingham. We have lovely open fires in the colder months, 4 screens to show most sports, a pool table, a dart board, a smoking shelter with a log burner and plenty of street parking. Church End Brewery Goats Milk 3.8% Wye Valley Butty Bach 4.5% Wye Valley HPA 4.0% plus a rotating guest ale. We also offer Carling, Starpramen, San Miguel, Prava and Guiness Hop House 13. We also have Tetleys, Ansells Mild, Guiness, Stowford Press and Aspalls. We have also been judged Finalist County Pub of the Year. You can also find us in the Good Beer Guide. Getting to us on public transport is very easy. We are a couple of minutes walk from the 50 bus stop on Moseley Road, and the 35 on Lincoln Street. We are approximately a 10 minute walk from Edgbaston Cricket Ground. We open at midday everyday.